Robert Jesselson Robert Jesselson is Emeritus Carolina Distinguished Professor at the University of South Carolina, where he teaches cello and plays in the American Arts Trio and the Jesselson/Fugo Duo. In 2013 he was named as the Governor’s Professor of the Year by the Governor and the SC Commission on Higher Education. 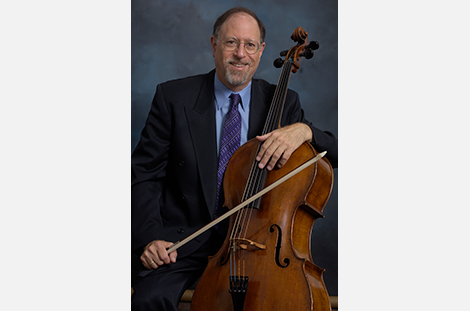 Dr. Jesselson is former conductor of the USC University Orchestra and the Columbia Youth Orchestra, and he was the cello teacher at the S.C. Governor’s School for the Arts for 17 years. For 15 years he was the director of the USC String Project, building the program into one of the largest and most prominent string education programs in the country. His pioneering work on this program was recognized in an article in the New York Times in December, 2003. ASTA awarded him the “Marvin Rabin Community Service” Award in 2009 for his work with the NSPC and teacher training. He is the recipient of the 2015 USC Trustees Professorship and the 2010 Mungo Distinguished Professor of the Year, the highest teaching awards given by USC. He has also been awarded the 2002 Cantey Award for Outstanding Faculty, the 1992 Verner Award, the 1989 S.C. Arts Commission Artist Fellowship, the 1995 Mungo Teaching Award, and the first SC ASTA Studio Teacher Award in 2005. Next summer Dr. Jesselson will be teaching cello at the Green Mountain Music Festival in Vermont. He plays a 1716 Jacques Boquay cello.